ChangeSchool Why would you be led by Trump? A number of short articles have appeared on this subject and quite a few from the London Business School, some even predicting that Trump’s leadership style will get him into trouble in the future. We already know that there is only so much power vested in the President, as Obama discovered, and there are counterbalancing forces that will stand in his way[i]. Trump has been a great proponent of Robert Moses[ii], the public figure who transformed the landscape of New York’s public spaces by building parks and buildings, held power for nearly 44 years and was known as the master power broker in New York. Robert Moses said ‘you can’t make an omelette without breaking a few eggs’, and Trump has said ‘you can’t build skyscrapers without breaking a few heads’! Trump has quite a job to do in building his power base and coalitions if he is going to deliver on his rhetoric of “draining the swamp” as he describes Washington. As someone said the role of a social psychologist is to be descriptive of what has happened and not prescriptive about perceived difficulties of a leadership style. We are not saying that Trump is or will be a good leader or that we like him; this piece focuses solely on how Trump and Hillary came across as leaders to their electorates and the impact it may have had. Harvard University’s Howard Gardner[iii], one of America’s most interesting psychologists, who applied a cognitive lens to leadership famously, said “Effective leaders create new stories that successfully wrestle with stories that already populated the minds of their followers”. In this piece we look at three specific characteristics of the leadership personas of the two candidates, how they came across to their electorates, and how it may have influenced people on their choices. 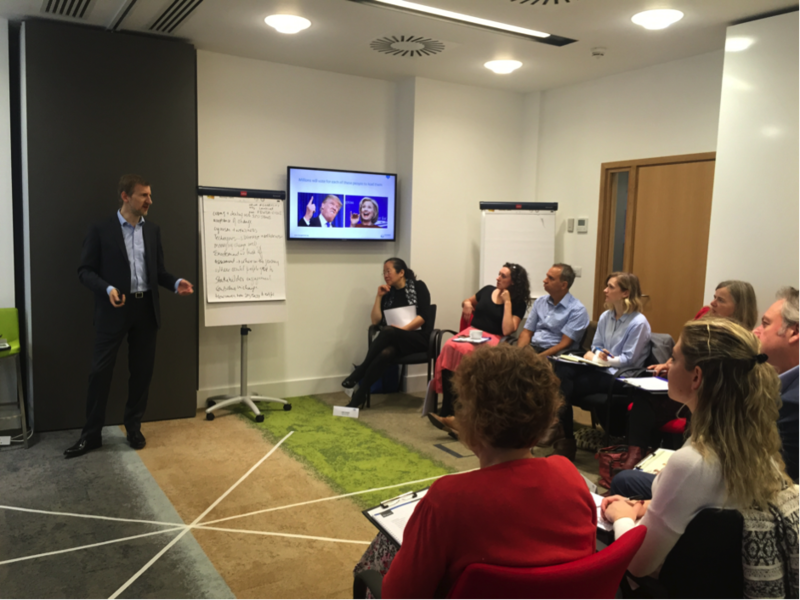 Three weeks before the election campaign we ran a course on the psychology of change for 25 CEOs. We started this session with a slide and footage of Hillary and Trumps focusing on how they came across on change. It was clear that Trump appealed to the emotional side of his audience and Hillary for the longest time in her campaign was happy to rattle off statistics. Her arguments were rational. They probably appealed to the intellectual elite. When we want to drive change, the rational argument is a necessary but not a sufficient condition. According to Chip and Dan Heath (popularised in their book Switch[iv]), to make change easy for people to adopt, you have to get them in touch with your feelings and Trump was a master of creating that kind of impact. A bigger enemy, visualization of a wall… he got his audience in touch with his feelings. We interviewed a number of people, including some senior professors from UCL on their perceptions of the two candidates and how they came across. Trump, though despicable came across as authentic. He shared his flaws. He said he had beaten the system. People didn’t mind. People even admired that, wishing they could be as successful as him. When tapes revealed his locker room talk, a personality flaw, Trump did not spend much time and effort on correcting it or trying to tow a politically correct line. Truly inspirational leaders selectively reveal weaknesses and dare to be different. In their work on “Why should anyone be lead by you?” Rob Goffee and Gareth Jones [v] argue that leaders don’t become great by aspiring to a list of universal character traits, and Trump trumped this one. Hillary neither revealed weaknesses – in-fact she spent enormous energy covering them up – nor did she dare to be different. People did not trust Hillary, she was too opaque. When accused of buying cheap steel from China, and bankrupting organisations to his own benefit, Trump was quick to admit he had done so because the system allowed it. The system was broken and because of how he had gotten around all the loopholes, he and not the establishment was best placed to fix it. It added to his credibility. People believed him. Not only were Trump’s messages consistent, they were pre-suasive. In the latest work by Robert Cialdini [vi], a solid influencer persuades by pre-suasion. 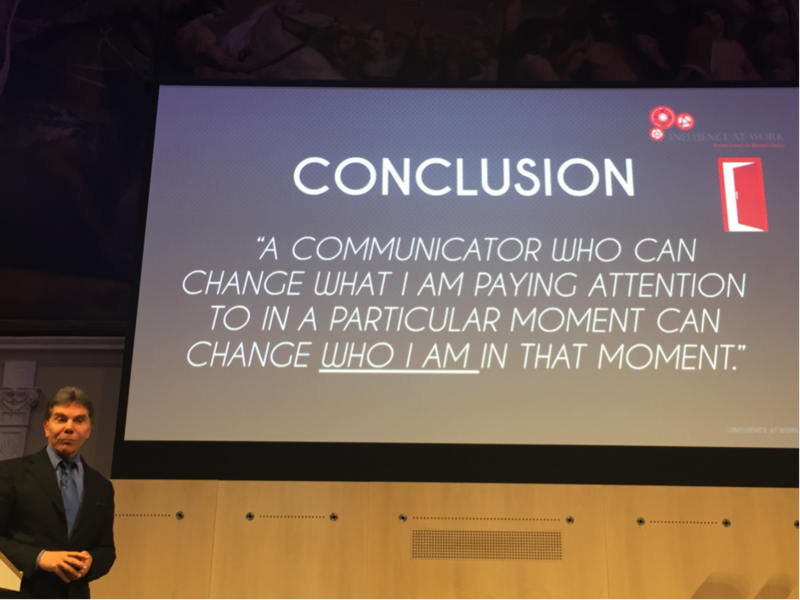 At a talk given by Robert Cialdini earlier this month at @RSAevents, he summarised his new work by suggesting that people who can get their audience to focus on the precise of goal of their message and before delivering that message, create a mindset (through words, images, situations) that is consistent of that goal, significantly improve their power to persuade. A classic technique use by people strong at influencing is that through movements before their message they create a mindset of receptiveness for those they seek to influence. Clinton and Trump were equally good at using levers of influencing like social proof, and individual stories of personal condition. Where Trump triumphed was his emphasis on losses and putting people in a frame of mind that gave him a privileged reception of his message. People were losing their jobs to China, Mexico and others. By putting people in this frame of losses, a psychological chute of thinking, people only considered losses, losses that had occurred due to labour arbitrage or efficiency innovations that had taken away jobs through mechanisations. This positive test strategy failed to ask the reverse questions: people did not consider the opposite –had there been new opportunities? With a big common enemy (China, Mexico), stagnation of job creation, a man who had successfully beaten the system vowed to fix it and made it a compelling case of persuasion. According to Prospect Theory[vii], the work that got Daniel Kahneman his Nobel prize, people in a loss frame of mind are likely to take riskier (all or nothing) decisions and that was one reason why the electorate was ready to take a gamble. Howard Gardner, mentioned earlier, did not distinguish between good and bad leaders from the perspective of social outcomes; he focussed on their effectiveness of their influencing. It just so happened that Trump was more effective as a leader – that he was able to create new stories that successfully wrestled and won over the existing ideas that populated the minds of his (new) followers. Bottom line, he did a better job of getting his stories across. Nationalism is up in India, in the UK, and now in countries like France, Holland and Austria. It’s a trend Trump had picked up a long time ago. He shared these views early on in 2000 [viii], when he considered standing for president with the liberal reform party. Trump had been in touch with his electoral base for a while. People believed his Jacksonian politics – that the US should not take the lead in esoteric global problems just because US always has. He just managed to increase that significantly to include what is called the “Springsteen” democratic base that effectively elected him. In the end his leadership persona as a change inspiring, authentic, and persuasive leader trumped that of Hillary’s. 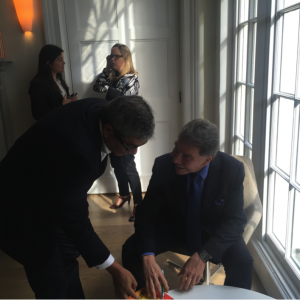 Author with Robert Cialdini at the Royal Society of Arts in October 2016. [ii] The Power Broker: Robert Moses and the Fall of New York; Robert Caro, Published by Bodley Head, 2015. America’s greatest builder; most prolific physical creator credited for changing the face of New York State and New York City. He built 658 playgrounds in NYC, 416 miles of parkways, and 13 bridges. Spent $135 billion (in 2000 USD) on public works. [iii] From Howard Gardner’s seminal work Leading Minds: An Anatomy of Leadership, written in 1995. Howard Gardner is an American developmental psychologist and the John H. and Elisabeth A. Hobbs Professor of Cognition and Education at the Harvard Graduate School of Education adjunct professor of psychology at Harvard University; and an Adjunct professor of Neurology of at the Boston University School of Medicine. He is best known for his theory of multiple intelligences that argued humans have several, relatively independent ways. He has authored thirty books in his field. [iv] Switch: How to change things when change is hard, Chip and Dan Heath, 2011, published by Random House Business Books. The heath brothers build on the rider, elephant and environment metaphor to help change agents design change that is easier to adopt. The rider is analytical, the elephant emotional and the environment removes friction. [vi] Robert Cialdini was most famous for his previous work on Influence: the psychology of persuasion, Harper Business; Revised edition, 2006. His latest work Pre-suasion, Simon & Schuster, 2016 looks at how top influencers focus the listener on the precise of goal of their message and create a mindset, using words situations images, that are consistent with that goal. [vii] “Prospect Theory: An Analysis of Decision under Risk” (1979), Kahneman and Tversky 1979. They proposed a (descriptive) model of decision making, which modeled real life choices individuals make that differ from optimal decisions. When human beings when framed with losses their choice making shifts from risk-averse to risk-seeking behavior. I personally conducted a number of experiments with MBA students over 2013, 2014 & 2015 and the results are staggeringly consistent with the theory.